A Microcurrent face lift is a non-surgical non-invasive cosmetic technique that provides an array of aesthetic benefits. 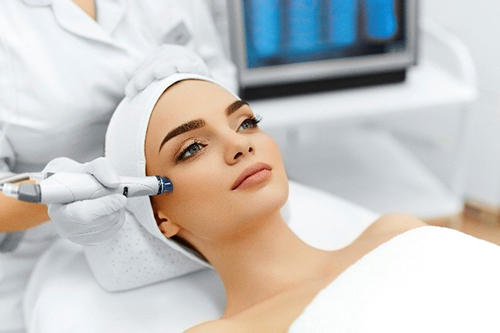 A Microcurrent facelift utilizes a technology whereby a low level of electricity is gently delivered to the treatment area in order to trigger favorable chemical reactions at the skin's cellular level. The Microcurrent face lift electrical current is much like the body's own natural electrical current which provides a number of benefits. A Microcurrent face lift can deliver a variety of benefits to patients who undergo this treatment. A Microcurrent facelift is safe and effective for the following purposes: to improve facial and neck muscle tone, lift jowls and eyebrows, rejuvenate the skin, reduce the appearance of fine lines and wrinkles, reduce puffiness and even out skin tone, improve facial circulation, skin exfoliation, lymphatic drainage, product penetration, sun damage treatment, and cellulite. Small lesions can be removed with minimal pain and no down time. We use the latest version of the Cryoprobe to make fast, simple work of removing freckles, Seborrheic keratosis, hyperpigmentation, warts, moles, hemangiomas etc. This treatment is fast and safe. Click here for videos and more information on cryotherapy. Microneedling simply uses the body own ability to heal itself. The skin reacts to the intrusion of the microneedles like it would to any other penetrating object. In total: 50- 70% overall improvement after only 3 treatments. Only at Integrated Skin Care and Root Causes Holisic Health and Medicine: Add a Super Power Punch to Your Procedure! When receiving a Microneedling treatment you can add a serum to your procedure. We have several solutions that will enhance your results beyond that which the Microneedling alone can achieve. The VI Peel has had a long history of providing excellent results to clients. The producers continually develop the product and the procedure to achieve better results. VI Peel has introduced a peel specifically for acne that has two levels of intensity that can be added to the basic VI peel for dramatic results. The VI Peel works on any skin type, even skin of color that has not responded well to peels in the past. A VI Peel is a skin treatment used to improve the appearance of the skin on the face, chest, hands or other areas. As a medical-grade chemical peel, the VI Peel is an effective treatment to improve several skin conditions and issues including acne, uneven skin texture, uneven tone, fine lines, wrinkles, acne scarring, sagging skin, age and sun spots, enlarged pores and hyperpigmentation. The VI Peel also provides a more youthful look by brightening the overall appearance of the skin and improving collagen production. A VI Peel can be performed in a med spa or cosmetic dermatology clinic and can be administered by a licensed nurse, a certified aesthetician or a medical doctor. While older procedures for chemical peels included skin preconditioning, there is no preconditioning needed prior to receiving a VI Peel. The application process can take up to 30 minutes and involves the chemical solution being topically applied to the skin. The peel is then left on the skin for five hours and washed off by the patient at home. Some patients experience light stinging during application, which subsides quickly. Patients can receive VI Peels repeatedly every two weeks until they receive their desired results; however, most patients need only one initial treatment followed by regular peels three to four times per year for continuing skin renewal and luminosity. Most patients report noticeable results within a few days after receiving a VI Peel. Results will include an overall improvement in the appearance of the skin including a more youthful glow and improved tone and texture. At Integrated Skin Care and Root Causes Holisic Health and Medicine we offer several types of paramedical peels. Each skin type, in combination with specific conditions is best suited for specific types of peels. Sometimes, more than one type of peel will accomplish the desired results, and the decision about which peel to use is made by the Esthetician in consultation with the client. The peels we do most often after the VI Peel, the Glycolic peel, and the Salicylic peel. Salicylic Peels used most often on oily skin types or acne prone skin types. Salicylic acid is a plant hormone from the white willow tree. It is the only peel solution that gets into the pores, and so this acid is frequently used in a very mild state, as part of our deep cleansing facials and acne treatments. This acid can be used at a variety of strengths to achieve deep pore cleansing or a paramedical grade peel. Glycolic acid peels are used most frequently on normal to dry and sensitive skin types. It is also considered to be natural because it is derived from sugar cane. Glycolic acid peels are the mildest peels. Typically, they are used to remove the top few layers of dead skin cells to give your skin that healthy, dewy look that we all want. Our Acne Treatment Really Works! 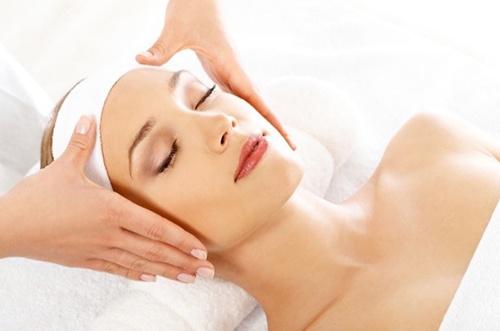 We perform an acne facial treatment like no other in the industry. We use highly effective topical products that are customized for your skin during each treatment. We use supplements to address internal imbalances that can contribute to acne. We use nutrition and lifestyle modification strategies to address the needs of your body and your skin. We get results. Call today! Your face has never been this clean! The deep cleansing treatment at Integrated Skin Care and Root Causes Holisic Health and Medicine begins with cleansing your skin the traditional way, with a cleansing product suited to your skin type. From there, we depart from the norm. We use granular exfoliants, deep cleansing solutions, enzymes, light acids for exfoliation, special clays, nutrients, oxygen, essential oils for detoxification, and a few other secrets! You can't get your skin this clean at home, or anywhere else but here! Microdermabrasion is a classic skin care service. It exfoliates and invigorates the skin. Microdermabrasion creates micro fissures in the skin that stimulate the repair process. As a result, your skin creates more collagen, elastin and protein peptides for newer, brighter skin. Dermaplaning is the process of removing the top layer of the skin along with the fine hairs on the face. This treatment gives a fantastic glow to the skin and improves skin function.